Andriy Kobolyev is against Russia's Nord Stream 2 gas pipeline to Germany. The CEO of Ukraine's state-owned Naftogaz said in an interview with DW that the project is "against the interests of Europe." For decades, Ukraine has been a major transit route for Russian gas to Western Europe, but the country's role in the supply line is diminishing. 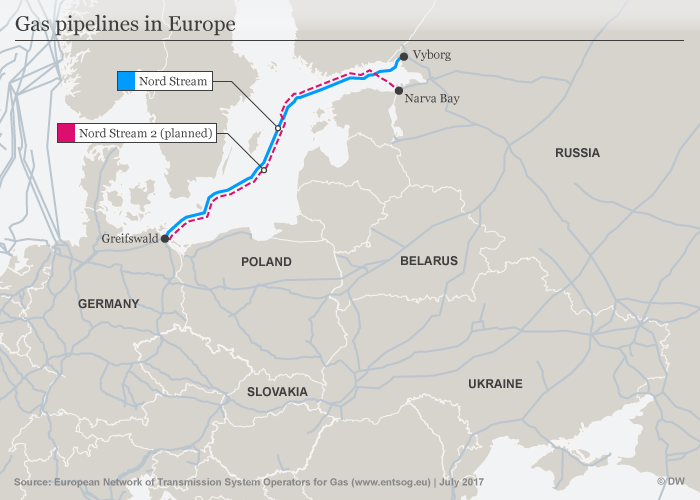 Since President Vladimir Putin came to power, Russia has pushed for alternatives, including the Nord Stream pipeline under the Baltic Sea to Germany. The planned Nord Stream 2 project would put Russia in the position to reduce the flow of its gas through Ukraine to the minimum level required. 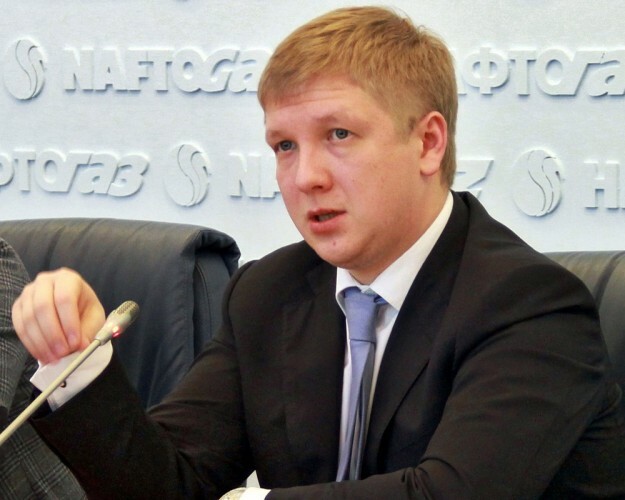 "By any means, the Russian Federation wants to circumvent Ukraine," Andriy Kobolyev, the CEO of the Ukrainian state oil and gas company, Naftogaz, told. "We understand the logic behind this project as being partly geopolitical, partly military." Kobolyev warned of possible grave consequences for his country. "Russia needs to remove transit from Ukraine for a very simple reason: because transit makes full-scale military aggression against Ukraine a very costly exercise," he said. A war would disrupt Russia's gas supplies to Western Europe through Ukraine for a long time. That would "cost the Russian state a lot, reputationally and financially," Kobolyev said. Despite the growing danger of a military conflict, Ukraine would also bear significant economic costs by losing the annual fees that Russia pays to pump gas through Ukraine. Kobolyev put the figure at more than $3 billion (€2.4 billion), which he said would naturally be a substantial amount for Ukraine's economy. Ukrainian President Petro Poroshenko is to discuss the issue with Angela Merkel during his visit to Berlin on Tuesday. It will be his first meeting with after the chancellor since the formation of her new coalition government in March. In an interview published in the Handelsblatt newspaper on Monday, Poroshenko called Nord Stream 2 "a political bribe for loyalty to Russia" and warned of "massive" negative consequences for Ukraine. He has suggested modernizing Ukraine's gas pipelines as an alternative. In his interview with Nemtsova, Kobolyev acknowledged that Germany would profit from Nord Stream 2, but said the country could also face long-term negative consequences. "Germany will lose its ability to appeal to the concept of solidarity," he said. "For example, on such important issues as migrants, I heard this from many Central European countries, saying: 'Look, Germany is asking us to follow the principle of solidarity when we talk about migrants, but when we talk about gas this principle is being forgotten.'" By selling cheaper gas to Germany and thus making German businesses more competitive, Russia would try to use "divide and conquer tactics" against its rivals in Europe. This, he said, is one of the reasons why Ukrainian officials believe that "the project is against the interests of Europe." The project has been criticized by the governments of some Central European countries, as well as the United States. The German government considers Nord Stream 2 a private commercial project and recently gave it the green light. As we reported earlier, Germany could benefit much more from gas supplies through Ukraine than from building Nord Stream-2, which is economically inefficient. Ukrainian President Petro Poroshenko said this in the interview. In particular, Poroshenko warned Germany against further construction of Nord Stream-2 pipeline, calling it 'purely political project funded by Russia'. 'Excuse my acridity, but Nord Stream II is a political bribe, given for the loyalty to Russia,' he said.